The formal opening of the St Helena Supreme Court took place yesterday, Tuesday 18 November, at 2pm. Various Civil and Criminal cases will be heard by the Supreme Court until Wednesday 10 December 2014. His Lordship, the Chief Justice, Charles Ekins Esq, entered the Courthouse accompanied by the Acting Sheriff of St Helena, Mr Harry Legg OBE JP, plus the Bishop of St Helena, Dr Richard Fenwick and Chief Magistrate, John MacRitchie. Lawyers, JPs, officials, the media and members of the public were also in attendance, including the Acting Governor, Chief Secretary and Acting Attorney General. 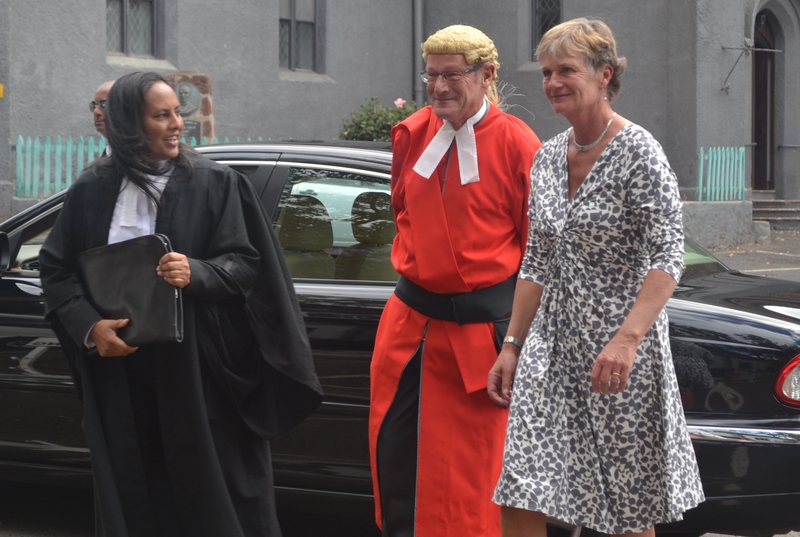 Acting Attorney General, Morag Stevenson, welcomed the Chief Justice and acknowledged new colleagues who have joined the Attorney General’s Chambers and the Public Solicitor’s Office since the Chief Justice’s last visit. Introductions were also made to new Lay Advocates, Jeffrey Dawson and Tony Green. The new Attorney General designate, Nicola Moore, was also mentioned, who will arrive on St Helena on Tuesday 25 November 2014. The Chief Justice said that it was a pleasure to return to St Helena and see familiar faces. His Lordship also reflected on those who are no longer with us, mentioning the late Bill Drabble’s passing, who served with distinction as a Lay Advocate for many years. The Chief Justice also praised the new additions to the Lay Advocacy service on Island and remarked on Mr Eric Benjamin’s work ethic, despite recovering from his recent illness. A photo is attached of the Chief Justice arriving at Court yesterday. Posted in News, Press Release Archive.